A friend of ours (Judi Neal) developed a model based on her research that represents how people adapt to change. In the model, two types of personalities look backward. Guardians dig their heels in and refuse to change. My husband Jim tells a wonderful story about his father, who refused to turn in his old black dial telephone and the phone company finally showed up with the town Sheriff to install a new pushbutton phone. The Placeholders are also resistant to change: they cite how well the old way works and find problems with new ideas. 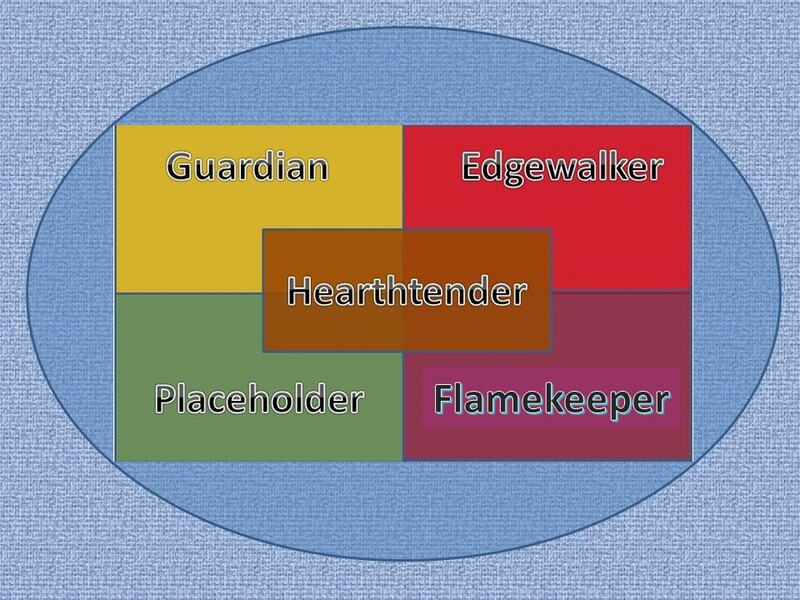 Hearthtenders sit firmly in the middle of this model. These people like to focus on the activities of daily life, and they pay attention to nurture and care of the community. They will adapt slowly to change. The personalities that look toward the future are the Flamekeepers and the Edgewalkers. Flamekeepers preserve the core values and guiding principles of the past while helping a community to move forward. Edgewalkers find the borders of worlds and choose to walk along the edges, often bridging worlds. They are the change-makers. Not everyone needs to be an Edgewalker. In Judi’s model, three of the 5 types readily adapt to change. Communities need Hearthtenders and Flamekeepers to maintain a healthy balance between stability and change. Communities will always have Placeholders and Guardians. The rest of us must treat them with compassion and respect as we help them to adapt to changing times. I am an Edgewalker in many areas of my life, but not all. When I worked as an executive leader in a Fortune 100 company, I was the person who created spaces and opportunities for my organization to experiment with different ways of working. I dragged my colleagues (the division’s CEO, COO, and CFO) to my technology conferences where they learned new ideas and applied them to the rest of the division. We brought EQ, Steven Covey’s 7 Habits, and employee-driven hiring into my division before any of these ideas were popular. We did things like African drumming, meditation, and flying paper airplanes with ideas scribbled on them to each other at our strategic planning sessions. If you think this was craziness for the sake of experimentation, it was not. My organization was profiled twice by Gartner as an exemplary, high performing IT organization. We won awards in strategic planning and performance measurement from outside organizations. Our employee turnover rate went from 32% at the time I became its leader to 4% after three years. In 2007, I left the corporate world to earn a doctorate in Human and Organizational Systems. Like the Edgewalker personality type, I decided to bridge two worlds: work organizations and chamber music ensembles. My research and current writing projects center on bridging these two worlds. Currently, my husband Jim and I are living a personal Edgewalker life. In 2015, we sold our house, cars, and furniture. We put the rest in storage and have been “intentional nomads.” The experience is very rich and a bit chaotic. How have we adapted to this life? We unpack our two suitcases immediately when we arrive somewhere (unless it’s for less than 3 days). We set up our writing spaces. We buy groceries and wine. We take a slow walk around the neighborhood to soak it in. We have conversations with shopkeepers (in Spanish or French when in countries that speak those languages). I find people with whom I can play chamber music. I play my violin. We get to know people and they get to know us. We are constantly in a state of wonder and appreciation for the nuances in each place. More importantly, I take care of my body, mind, and spirit. I meditate regularly and find a local yoga studio for classes. Jim and I work on our projects on a daily basis, regardless of location. We set aside time to relax and do nothing. We have video calls with friends and family members to stay connected. It is true that adaptation is an inner process. For me, the secret to adaptation is to find my internal center of balance and take intentional steps from that place. Meditation, yoga, exercise, and reflection are the practices I use to find and maintain my center. The most important actions and risks that I take from that center include the many conversations I have with the people I meet along the way. When there is connection with others, even when we communicate imperfectly because we are not fluent in each other’s language, we are helping each other to adapt. We help each other to adapt to a chaotic, evolving world by embracing our common humanity. Thank you. Something I need to think about right now. Lovely application of a model..